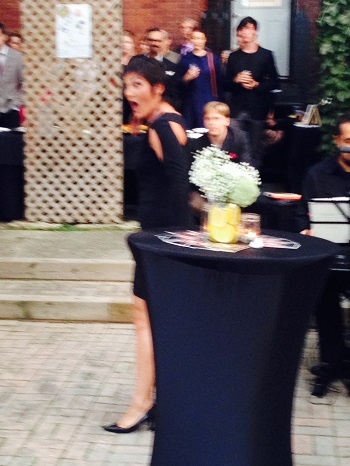 So, after the rather scattered events of the summer last night’s fundraiser for Opera 5 at Atelier Rosemarie Umetsu felt like the start of a new season. It was well attended and organised in an intriguing and fun format. Basically, Team Day and Team Night were competing to see who could raise the most money. There were four rounds in which a singer from each team presented an aria, song or MT number. The one with the most pledges got to sing his or her “show off” aria. For an additional donation, the loser got to do the same. Given that some of the city’s best young singers were performing it was to be expected that it was a good show.